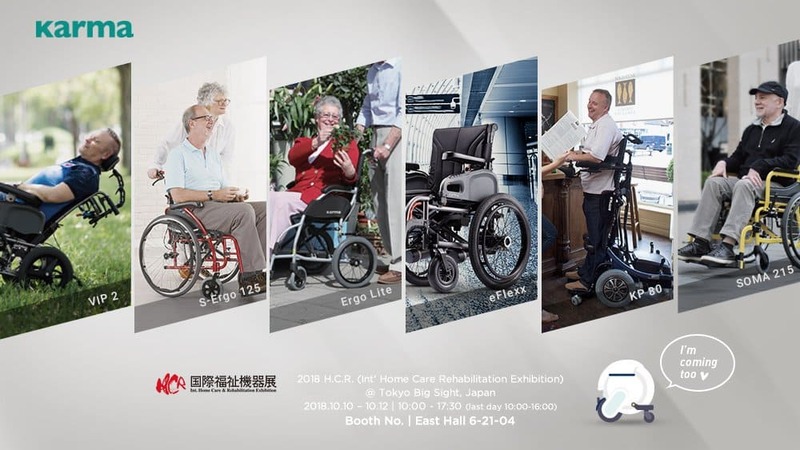 We are pleased to invite you to visit Karma Medical’s booth at H.C.R 2018. This is our 30th year anniversary. As we keep learning about the needs of wheelchair users, we ask ourselves what might be the NEXT generation of wheelchairs? This year, a new milestone has been excitedly made. We can not wait to share this intelligent product with you. Join us to learn more about a mobility solution that incorporates robotics, IoT, cloud, and other latest technology. Ergo Stand | Ergo Stand Creating a new vision for wheelchair users by face-to-face interactions. VIP2 TR | The one and only foldable tilt-in-space and recline wheelchair. S-Ergo 125 | Designed for senior citizens with detachable armrest and footrest. Ergo Lite Series | Providing solutions for long-term sitting and ultra-lightweight for daily carriage. SOMA 215 | Compact, easy to transit, and defined to be affordable. iBuddy | The brand new concept of mobility solution goes beyond your expectation. Come to our booth to find out more. We look forward to seeing you soon.